Rugs have long been a surefire way to add color and excitement to any house. They unify a room’s decoration scheme and transform a dull space into something more vibrant and stylish. Despite how people often approach rugs—often a last-minute addition to protect wooden floors—they can be used in diverse range of ways to make your home’s interior design memorable. 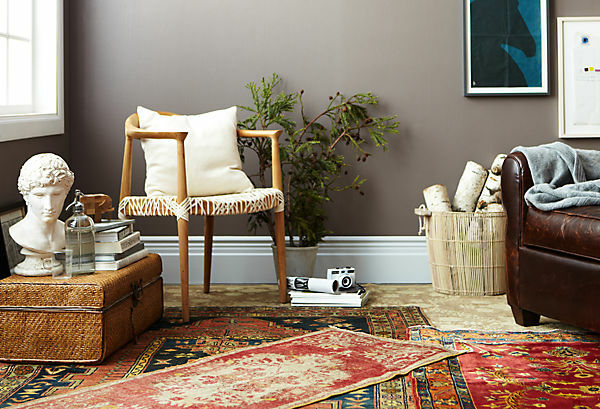 There’s only one rule-of-thumb when it comes to purchasing rugs: be experimental and open to new possibilities. Layering rugs is one trend that has been catching on in many homes. Layered rugs give rooms a subtle depth, and although it may not be the first thing that someone notices, it’s a unique way of using rugs that leaves a lasting impression. For example, try layering a bright, patterned rug on top of a solid color rug. Experiment. Pile different types of textures and colors to change a room’s aura and sensibility. For more classic décors, layer different types of woven tapestry rugs and Persian rugs. Start with a larger Persian floor rug then layer with Persian rugs that have different color palettes and are different sizes. Although some interior designers advise not to purchase rugs that are drastically different from one another, why not contrast golden floral patterned rugs with deep purple, solid grey or black rugs? The differences in color will create a dynamic backdrop, giving a room an idiosyncratic and bohemian feel. Another popular rug trend: use abstract or geometric patterns to create a new sense of scale and drama to a room. Some homeowners purchase rugs with diamonds or dots, while others use zebra stripes layered on top of solid colored rugs. Texture is also another easy and wonderful way to add character to a room. For example, thick, yarn rugs of a deep, earthy tone, such as mahogany or dark gold, add warmth and coziness to any room. Smaller Persian rugs and hand-woven, colorful rugs also make an ideal wall tapestry. As paintings or photographs, a wall tapestry adds character and color; they also tell a story. A rug as wall tapestry makes it the centerpiece and focal point to a room, which will also help you map out a unique color scheme for the space. In terms of shapes, one doesn’t always have to go with regular, rectangular rugs. If you look at the layout of your room and in particular, the way your furniture is arranged, think about the best ways to utilize space. Rather than a rectangular rug, will an oval rug be more complimentary? Should you purchase a larger floor rug or a narrower rug to brighten up the room? A rug is a creative and affordable way to remake any room in your house. For additional decorating ideas, rely on the experience of Rugco, a trusted Orange County Rug store that has been decorating Orange County homes for over 20 years.